La Libertà is a quartet that began in Fall of 2015 as a musical collabroation between June McCrory, Debbie Daly, Katy Larkin and Beth Carusillo. The mission of La Libertà is to promote true love by deepening understanding of the human condition. Utilizing melody, narrative, rhythm and exchange, La Libertà offers the remarkable gift of honest and tender insight to shared experiences. ​The name La Libertà is Italian for "lady liberty" or "her release." 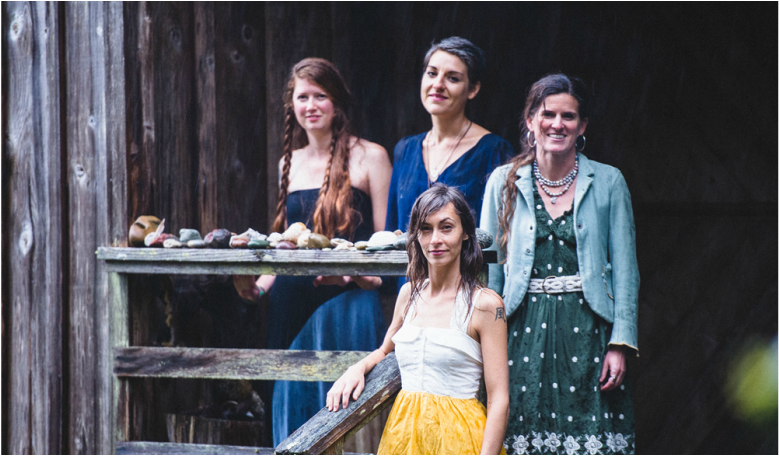 The earthy force and unearthly grace of La Libertà's music is for those who tenderly and fiercely carve their own way – music born from the windy wilds of the northern California coast. La Libertà is creating an 8-song debut album of heart-centered music written by June, and is raising funds for post-production, mixing and mastering, artwork, reproduction and distribution. The fundraising goal for this project is $10,750 by June 2016. We have huge gratitude for our first wave of contributors! The first phase of fundraising for our debut album is complete, and the band received enough support to continue on to the next step in production. We will continue to accept donations as the release date draws near. Pre-order your La Liberta album at our live shows, or by donating $50+ to our debut album campaign. Donors of $250+ will be listed as La Libertà Founding Supporters in the album liner notes and will receive a complimentary copy of the album.